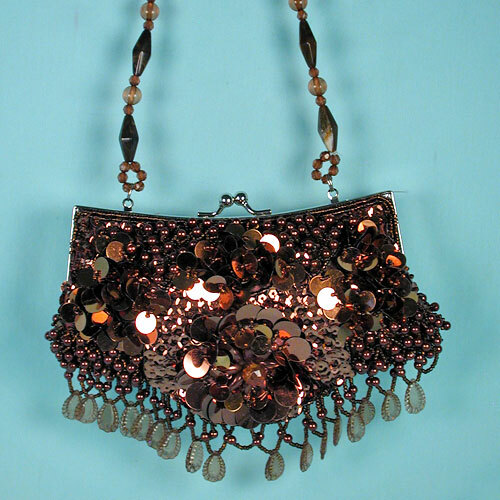 Beaded and Sequined Fringe Purse with Beaded Handle This elaboaely styled sequined and beaded evening bag has an eloquent design with lots of old fashioned pizzazz. The metal frame has a ball and socket closure. The matching beaded handle has a 6-1/2 inch drop. It is lined in matching satin with a side pocket. A georgeous bag for either a vintage or avant guard ensemble. Color: brown Hue: Code: #6A4D00. Measurements: width 7½", height 4-1/4", depth 1½.